New York may just have the title as the "Big Apple" and Jakarta is also the capital of the Republic of Indonesia as the "Big Durian", then the Yogyakarta may be called"Big Jackfruit" (= Nangka Giant). Why Jogja can be called as such?? For culinarygudegnya that is so popular and very tasty and healthful. Delicious cuisine made ​​from young jackfruit is as a food mandatory for anyone who was visiting the touristparadise on the island of Java. 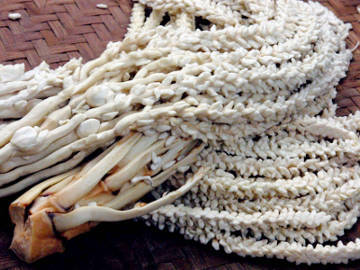 Gori (young jackfruit) in such a way that gummycleaned and then cooked in coconut milk with herbs and spices for hours. Once cooked, categories become soft and slightly sweet. Gudeg usually served withsambal goreng krecek (cowhide) spicy, boiled egg, tofu and tempeh bacem, as well as chicken or chicken bacem opor. As a final touch, warm watered savory arehwhich gives the distinctive taste is second to none. Yum-yum. Maybe for most people, warm is warm. But there are actually three different types of warm; warm wet, warm, dry and warm Manggar. Wet warm coconut milk served with a tasty nyemek and much sought after for breakfast menu. Gudeg this type can be found along Jalan Kaliurang area Barek, Gudeg City Limits (Jl. Adisucipto front Saphir Square) or mbok-mbok gudeg sellers in traditional markets. Warm dry cooked in a longer time until the liquid dries and the color is more brownish. It was also much sweeter. Gudeg this type can hold up to 24 hours or even more if put in the fridge so many people hunted as souvenirs. Usually the seller packaged in cardboard boxes, baskets (boxes of woven bamboo) or kendil clay.Not to be confused with where to find because most of the stalls warm like Gudeg @ Yu-Narni (+62 274 867231; Jl. Palagan Students' Army 102), Yu Gudeg Djum (+62,274 515 968; Jl. Kaliurang Km 4.5 Coral tamarind CT III/22), Gudeg Ahmad Bu (+62,274 520 049; Jl. Kaliurang km 4.5), Bu Gudeg Tjitro 1925 (+62,274 564 734; Jl. Janti 330), and sellers in the area Wijilan gudeg sell souvenirs special this.In addition to warm young jackfruit, Jogja also has a warm Manggar. Manggar aka coconut flower produces a sensation on its own delights this culinary offerings. The flowers were crunchy while the stems have a flavor similar glimpse of oyster mushrooms. The more limited supply of this culinary Manggar causing increasingly difficult to find. Some sellers are forced to close shop and only serves bookings only. Only a few places that still stand as some areas in Bantul and Public Eating Mbok sideboards (+62 274 445697; Jl. Parangtritis km.7). 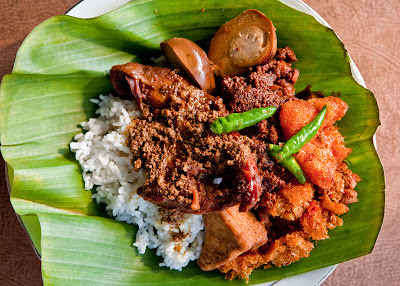 Gudeg can be found in almost every corner of the city of Yogyakarta. But the region was Barek Wijilan and most famous as the center of warm. Wijilan complex located not far from the Sultan's Palace and is a 10 minute walk or to ride tricycles.Preceded by Mrs. Slamet start selling since 1946, is now around 17 stalls lined up to meet the Jl. Wijilan. You can choose according to taste warm. Yu warm Djum (Jl. Wijilan 31) for example, presents the warm dry with a sweet taste typical cuisine of Jogja. Kreceknya small sliced ​​and then cooked into a creamy sauce fried. If you want a warm that is not too sweet, you can come to the Gudeg Bu Slamet (+62 274 380429; Jl. Wijilan 17). The average stall gudeg in Wijilan open from 5:30 am to 8 pm, except Gudeg Bu Tarto (Jl. Wijilan 15) which is open 24 hours.If you happened to be in the north of Yogyakarta, try to come to Barek. Every dawn, sellers gudeg lined the roadside in the northern region UGM campus. When the morning starts before and traders are packing up his wares, there is still a warm stall Ahmad Bu (+62 274 520049; Jl. Kaliurang km 4.5) is famous to the artists and officials, Yu Djum (+62,274 515 968; Jl. Kaliurang Km 4.5 Coral tamarind CT III/22), Yu Narni (+62,274 589 687; Jl. Kaliurang km 4.5 Karangasem CT III/19), or Bu Tini which is open until midnight. These shops also provide an opportunity for those who want to see the process of cooking warm.